We are entering a very exciting time in agriculture. With so many great software platforms and data collection tools we are on the cusp of unlocking some really deep, profound information and management techniques like we’ve only dreamed of before. Being able to stack several layers of data on top of each other begins to tell an interesting story at angles that we weren’t able to look at until now. This is great stuff and is really interesting until we realize one huge, uncomfortable truth about the very foundation of our data: our soil tests really aren’t all that accurate. Don’t get me wrong, the test results we get from soil labs generally get us to a place where we can determine a fertilizer application rate that nets us a return on our investment and at this point in time soil sampling is one of the best investments you can make on your farm. However, there are several areas where we could be doing much better. The truth is that soil testing needs to go to sensors. If there is some venture capital still laying around somewhere that wasn’t burnt up by building all of these startup companies that try desperately to create a knockoff of Climate, please use it to invest in a sensor-based soil testing program. Seriously, it can only improve what we have been doing through the lab. We’d drastically reduce turnaround time and drastically increase the sampling frequency from once every 4 years to once a year. In science, isn’t a larger, more frequent data set preferable to a smaller and less frequent one with all other variables remaining the same? Now labs are getting better at turn around time and they do a really good job of executing the procedures and methods that we currently have in place, even if many of these procedures are 70+ years old. However if you look closely, these methods of measuring nutrients can leave a lot to be desired in the accuracy department, which in turn can create a lot of “How the heck do I answer this?” type of questions when your soil tests come back from the lab. A really skilled soil scientist can help you navigate many issues that can baffle even really good agronomists, but there are some issues that still stump those soil scientists. One flaw may be in the fact that our current system relies on point samples and in many places, the soil is much more complex than what can be captured in that system. And let’s face it, you are only as good as the data you collect and are able to utilize. Precision Planting is on the right track with putting sensors on seed firmers. Testing the soil right in the row and on every row? Yeah, that’s a pretty good idea. I do question the effectiveness of the measurements at just the seeding depth, which is a far cry from the 6-7” that our land grant university recs are made from, but it’s a step in the right direction and maybe those university recommendations need to be updated to new technology as well. The Veris machine also shows promise and seems to be a great option for my counterparts out east who can’t always get deep enough soil samples in rocky soils. But how well does the system scale in the Midwest? I invite you to join me in the quest to bring soil testing to the field and improve the accuracy of the several decades old soil testing procedures. We can only build as high as our foundation is strong, and in agriculture that begins with a thorough understanding of the soil. 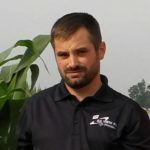 Ben Johnson is the Precision Farming Coordinator at Ag View FS in Princeton, IL. For nearly 15 years, he has been on the front lines of precision ag by delivering actionable data and solutions to the farm gate. Johnson also takes the time to look at the forest through the trees and asks some challenging questions of the status quo in the industry. You can reach out to him at [email protected]. See all author stories here. Trimble’s 3 D Soil Information System uses 5 layers of collected information and intelligent targeting software to understand soil physical and chemical properties down to 1200mm. This data can be collected on 2.5,5 and 10M resolutions giving unprecedented spatially correct information about soil variation in both surface and sub-surface horizons.